We were shown a large border planted with Echiums and Eleagnus, both great for bees when in flower. 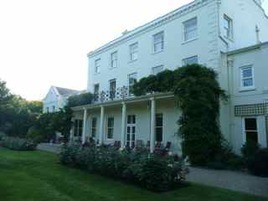 There is a tennis court and small secluded lawn area used by the Governor’s family for recreation, including perhaps the odd game of croquet, with many trees around the edges of the grounds providing a barrier to road noise - these include the Californian Bean Tree and many Lime Trees, again great for bees. The original face of the building looks towards Mount Durand, and you can still see the decorative concrete entrance urns among the border plants. In front of the building is a neat square lawn with beautiful rose beds - some of these are Elina roses, which apparently used to be known as Peaudouce, until a nappy firm decided to brand its product with the same name. Climbing up the walls are some established Wisteria plants, and Gary assured us that the roots would not cause damage, but the expanding stems would easily push apart slates or gutters if allowed to intrude. The lawn, surrounded by huge Camellia plants, is well cared for - States garden apprentices have been practicing their scarifying skills on it, and will be returning for a spot of hollow tining. 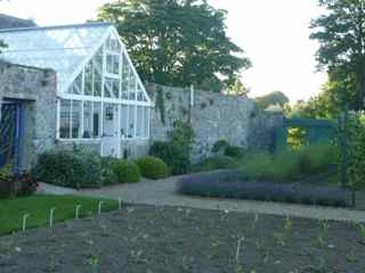 Before too long, to the sound of several gasps of delight from the group, we were led through a small gate that opened out into the wonderful walled kitchen garden. First treat was a large, neat Brassica bed, recently planted with young plants. The bed had been well watered the day before, and each plant was “puddled in” to get it off to a good start - Gary explained that the bed had previously been used for flowers, and had become riddled with bindweed, so it was decided to clear the area and start again with veg; it was certainly looking clean and lovely when we arrived. The three gardeners employed by Government House practice crop rotation, and next year the Brassica bed will host the year’s crops of spuds. Around the garden are high brick walls, with cane fruit such as Logans and Raspberries against the North-facing wall. This doesn’t seem to bother them though, and we could see large amounts of young fruits setting. There was a fine fruit cage, with more cane fruits and long lines of Strawberries planted through black weed-suppressing sheets. One or two seemed to be a bit poorly, and Gary suspects ants as the culprits. 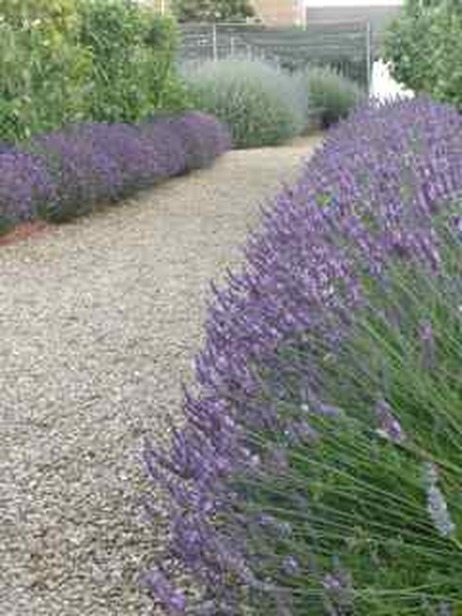 Alongside the fruit are mixed veg beds, partly surrounded with Lavender hedging. These have all been propagated from cuttings taken from a few original plants, and seem to attract Large White butterflies away from the cabbages. Interestingly, the Large White, aptly named Pieris Brassicae, together with its smaller cousin, the Small White, can both claim the title “Cabbage White” as they both have Brassica loving larvae (I looked it up). They are some of the most common and widely distributed of British butterflies, so there is no escaping them. The veg beds were planted up with our familiar favourites, such as leeks, fennel, beetroot, squashes spinach, onions, potatoes and green beans planted in succession. The young leek plants were waiting to be weeded, and Gary described how they will be planted around 9” - 12” deep, using a large crowbar as a dibber to make a good hole, and the young plant popped into the hole with just the top of the leaves showing. This will ensure that a good proportion of the stem is white when harvested. The young plants would then be well watered in - no soil will be pushed into the hole, in order to prevent grittiness between the layers of the mature leek plant. The onion plants had been bent over waiting for the leaves to brown off before harvesting and drying - the red onions had a tendency to produce seed heads, but these are regularly cut off to keep the bulbs well fed. 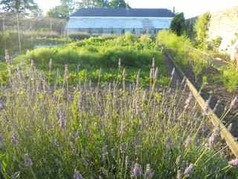 There are two large Asparagus beds, one around 30 years old and the other planted just 8 years ago. As gaps appear, new crowns are planted in. The kitchen is supplied from April until mid June, after which the plants are left to grow and store up goodness for next year’s brief season. The first and second early potatoes had suffered from blight and the foliage had been removed, leaving the tubers in the ground until needed. The lates were still ok, and had been sprayed with Bordeaux Mixture as a preventative measure against the dreaded disease. 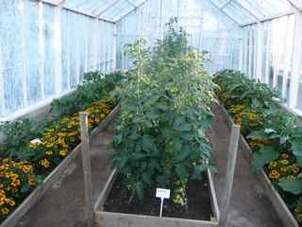 Nearby is a small greenhouse used for Tomatoes, Peppers and Chilies. Whitefly are held at bay in the greenhouse by rows of companion Marigolds, and Gary tells us they don’t need to spray in there at all. Among the outdoor veg beds were some impressive flowerbeds, with wonderful displays of Dahlias, Peonies and Sweet Peas. The Dahlia tubers are stored on dry peat in the greenhouse over winter and cuttings taken each year as they sprout. The Sweet Peas were prone to a soil borne disease in their original site and are now grown on a new bed, which seems to be more welcoming. 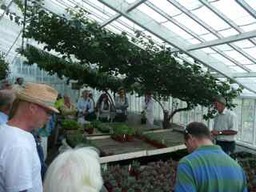 Alongside the area were several neatly pruned espalier top fruits, just like in the gardening books. Outside the fruit and vine greenhouse were trays of Sweet William and Wallflower seedlings, ready for pricking out for planting in October. Next treat was the vine house, whitewashed against excessive heat, with Apricots, Peaches and a Lemon tree doing well. Some large grape vines were bearing many developing bunches, although these had already been thinned out. There was also a wonderful contraption in there, built after the war by some inventive Royal Engineers, to enable the gardener to thin the fruit. It’s like a wooden staircase with very wide steps, leaning against the back wall of the greenhouse and set on wheels each end running on rails. So you climb up and sit or kneel on one of the wide steps and do your thinning within reach, then simply wheel the thing along a bit to do the next section. Clever. Back outside the Greengages have been marmalised by snails and slugs so we marched smartly past to the beehives. There are four hives, two being dedicated to the household. Gary is an experienced beekeeper and even catches his own swarms - he enjoyed telling us about the occasion he had to follow a swarm as far as Victoria Road, where they settled next to the Ex-Servicemen’s Club (very discerning) before being gathered in by their keeper. And that was it - a very enjoyable evening with some fascinating insights into how a kitchen garden is run by the professionals. Well done to our organising committee and thank you to Gary Le Poidevin for his time and enthusiasm. If you think you might like to be the next apprentice gardener there, relax - I’ve already got my name down.